Ball of confusion – For the fainthearted . . . Were the song being written fifty years later, the material available to the writers would be even more plentiful than it was in 1970. 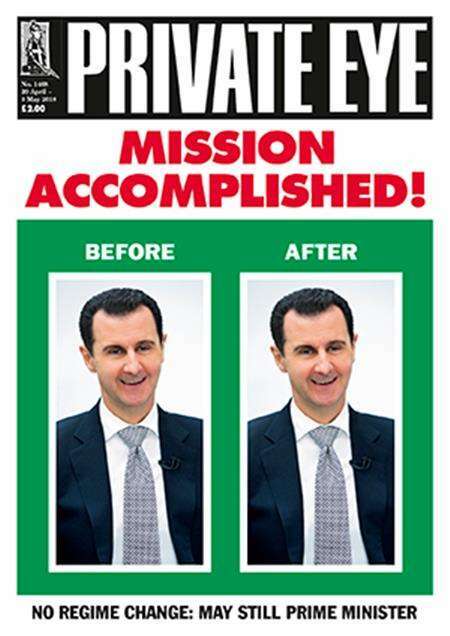 The cover of this week’s edition of Private Eye carries a banner feclaring “Mission Accomplished.” Beneath the headline are two identical photographs of President Assad of Syria, one with the caption “Before” and the other with the caption “After.” The United States, Britain and France spent tens of millions on a missile attack against Syria, claimed success in inhibiting Assad’s violence against his own people, and changed nothing. Whatever the truth in Syria, there will be no happy ending, each alternative is obnoxious. As long as it suited its purposes, the United States maintained cordial relations with the Assad regime, including using it as a place for interrogation and torture of suspects brought there by the “extraordinary rendition” programme. United States’ antagonism towards Syria has ensured active Russian intervention in support of Assad, yet it was not so long ago that President Trump and President Putin were declaring friendship for each other. There is no solution to the Middle East conflicts that does not mean significant suffering, and the suffering will not be among the politicians or military commanders. Private Eye is right, nothing changes, ball of confusion is a model of clarity compared to what the world is today.